The Cycling Embassy of Denmark (CED) is a comprehensive network of cycling professionals from private companies, local authorities and non-governmental organizations working together to promote cycling and communicate cycling solutions and know-how. The CED was established in 2009. Our mission is to encourage cycling all over the world by sharing our knowhow and expertise in the area of cycling. Among us, the Cycling Embassy of Denmark’s members represent the latest knowledge of all areas related to cycling be it planning bicycle and people-friendly cities, creating synergy between cycling and public transport, building safe infrastructure for cyclists like cycle tracks and bicycle bridges, developing successful campaigns that motivate people of all age groups to cycle, designing urban furniture like bicycle pumps, bike counters, and bicycle parking facilities, and much more. What does the Cycling Embassy of Denmark do? The Cycling Embassy of Denmark can assist with the coordination of masterclasses, study tours, lectures, guided bike tours in the Danish cycle cities. The Danish cycle cities vary a lot in both size, topography, and level of development in terms of cycling. So, visitors can be sure to find a city to mirror their own. 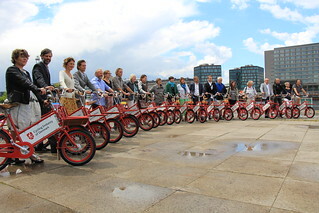 The Cycling Embassy of Denmark receives over 100 foreign delegations every year. All of them come to study cycle solutions in the leading Danish cycle cities like Copenhagen, Aarhus, Odense, and Randers. We also often give presentations at international conferences sharing best practice examples from Denmark on topics like policy development, planning, campaigns etc. Every year, we choose an individual or an organization that we want to acknowledge and honor for their work to promote cycling. Award winners include such prominent advocates as former Mayor of New York, Michael Bloomberg (U.S.), Roelof Wittink (NL), Lake Sagaris (CL), Randy Neufeld (U.S.), Vice Mayor of Munich, Hep Monatzeder (DE), Tony Lo, CEO of Giant Global Group in Taiwan, one of the world’s largest bicycle brands, Deputy Mayor of Paris for Transport, Christophe Najdovski (FR), and Philippe Crist from the International Transport Forum at OECD.